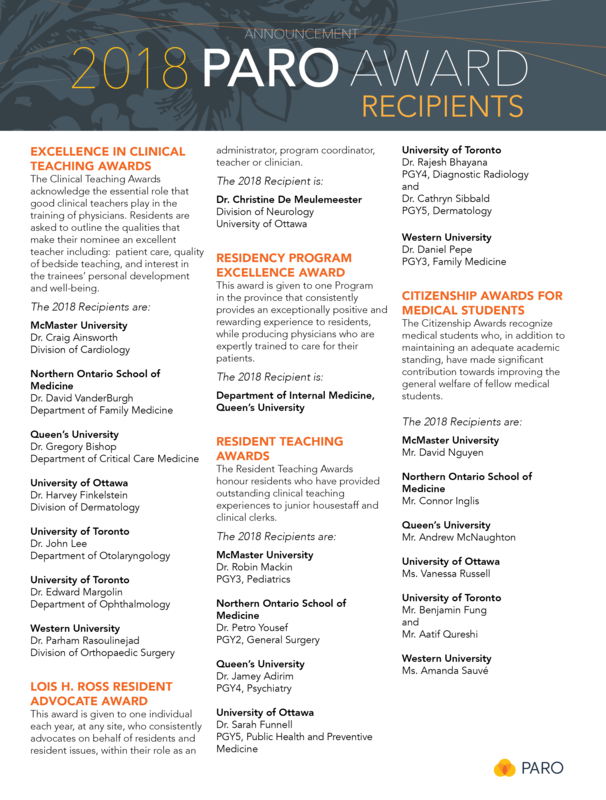 On May 11, 2018, the recipients of the PARO Medical Student Citizenship, Resident Teaching, Clinical Teaching, Resident Advocate and Program Excellence Awards were honoured at a celebration in Toronto. For a full copy of the announcement, please click here. Recipients of the Program Excellence, Resident Advocate and Clinical Teaching Awards received a unique and individually handcrafted glass sculpture inspired by the Ralph Waldo Emerson quote, “The creation of a thousand forests is in one acorn”. The acorn is a symbol of strength and perseverance. It is small yet strong and can withstand many of nature’s forces to grow into one of the mightiest of trees. Acorns only appear when an oak is fully mature, nearly 80 years! Although this alone is a fitting symbol for residency, in combination with the oak leaf it also perfectly illustrates the relationship between mentor and mentee. The oak leaf is a symbol of leadership and the oak tree nurtures and protects the acorn, which through time and dedication will grow into an oak tree that will nurture and protect future acorns.